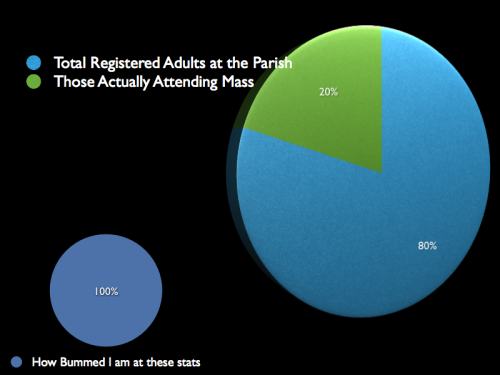 We have approximately 22,000 parishioners, 10,000 of which are adults. Do all of these adults attend our parish every week? No way. Only about 6,400 individuals (children and adults) attend each weekend. If our parish coincides with the national averages, that means about 2,540 are adults, and 3,860 are kids. So that means out of our 10,000 adults only 2,540 get to Mass, and of that number a substantial portion are monthly Mass goers. And our parish is getting bigger. Right now we are at 5,300 families and are expected to climb between 7,000 to 10,000 families in the next 15 years, due to the influx of Exxon employees to their new super complex just south of The Woodlands. We have three priests. Our pastor is a diocesan priest and is supported by two associates from an Indian religious order. We have 4 very active deacons as well. Our staff is probably 30 people, not counting the school, that are part or full time. This means that for 22,000 parishioners we have 7 clergymen and 30 staff. That's just a mere 595 congregants per staffer! For now. In five years it will look more like 811 congregants per staffer.